Written by Mac Walters, lead writer of Mass Effect 2 and 3! MARCH 2, Seattle, WA–Today at Emerald City Comicon, Dark Horse Comics announced a new ongoing canonical entry in the Mass Effect series! Mass Effect 2 and 3 lead writer Mac Walters kicks off a new ongoing series, set in the vibrant, engaging world of BioWare’s blockbuster science fiction epic! Fans of the award-winning franchise will find new characters tied directly to the newly announced Mass Effect 3: Citadel single-player DLC. Mass Effect 3: Citadel will release worldwide on March 5 on Xbox 360, PC, and PS3, and on March 6 on PS3 in Europe. Price: $14.99, 1,200 Microsoft Points, or 1,200 BioWare Points. In addition, fans can read the exclusive interview with Mac Walters on Comic Book Resources. 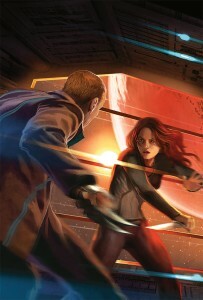 Mass Effect: Foundation #1 is on sale July 24 in comic shops and on Dark Horse Digital. This entry was posted in Columns and tagged DARK HORSE COMICS, eccc, emerald city comicon, mac walters, mass effect. Bookmark the permalink. Follow any comments here with the RSS feed for this post. Post a comment or leave a trackback: Trackback URL.